(Tupinambis rufescens) Tegus can run on their hind legs. They are highly intelligent, learning to recognize their owners, becoming docile and in some cases even ignoring food in favor of social interaction and they love to swim. What does the Red Tegu eat? Tegus are omnivorous, foraging for a wide range of foods, including fruit, seeds, various arthropods, small vertebrates, carrion, and eggs. Approximately 10 years in captivity. How many Red Tegu can be born at a time? Tegus are large reptiles, with some species reaching a total length of around four feet, and a weight of approximately fifteen pounds. 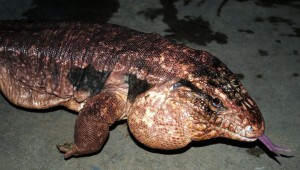 Tegus are sexually dimorphic, with males growing larger than females and developing prominent “jowls” along the base of the lower jaw. Tegus can run on their hind legs. Tegus are highly intelligent, learning to recognize their owners, becoming docile and in some cases even ignoring food in favor of social interaction. Mars – came to us in 2009. He was donated to the Zoo by someone who had him as a pet, but could no longer care for him. We often take Mars out on educational programs. He also just loves to bask in the sun on warm days and greet the visitors at the facility.